Born in Yaizu, Japan, in 1929. He held his first exhibition in Yaizu at his age of 28, in 1957. In 1961, he went to France at age 32 to study the techniques of wood block prints at the print atelier in the Atelier 17 where he worked under Stanley Hayter. In 1972, he won the Young Contemporary Print Artist Award in The Third Culture International Print Exhibition in Tokyo. In 1957, he held an exhibition in Tokyo. He later held exhibitions in Paris, Brussels, Strasbourg, Germany, Tokyo, Kobe and Nagoya. 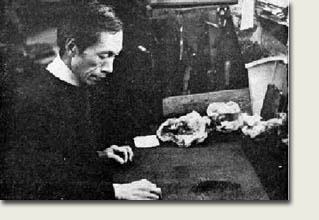 Shoichi Hasegawa, a worldwide famous Japanese print artist and painter, learned the techniques of color etching and aquatint in Paris. Museums in France and the U.S. discovered a unity of oriental and occidental expression in his collection. Dualism of the orient and occident is expressed symbolically in his art.